The time period when the popularity of the rosary as we now know it really exploded was around the middle of the 1400s: the first "rosary fraternities" (pious societies) were founded in Germany and Belgium in the early to mid 1470s. 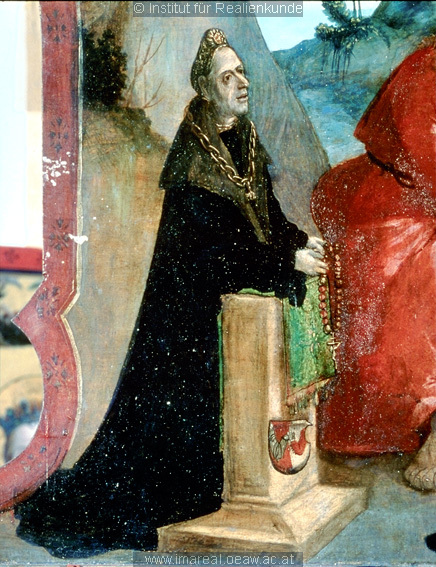 Something like 100,000 people throughout Western Europe had joined various rosary fraternities by the early 1480s. Rosaries/paternosters became a popular item of personal jewelry and were worn by people of all classes as routinely as we wear a wristwatch or cell phone. 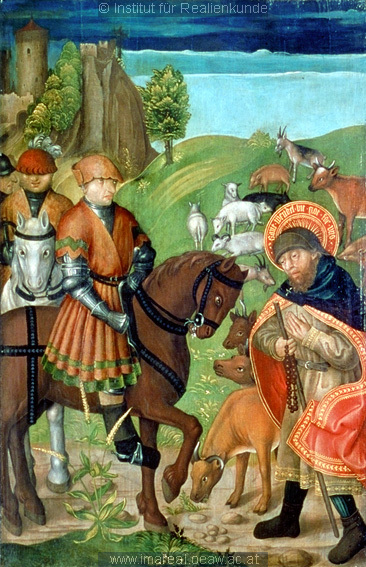 There is also a fair amount of evidence of the use of Christian prayer beads (paternosters in the more general sense) dating back at least to 1041, when Lady Godiva (yes, she did exist) bequeathed to the monastery she and her husband had founded a string of gems that she used to count her prayers. There are surviving paternosters from the 13th century (mostly fragmentary), and there is documentary evidence that dividing the beads into groups of 10 for counting purposes is a practice that arose well before 1400. However, my research suggests that there was not a general pattern of "allusions" to the rosary in the form of dots or markings in groups of 10. Rather, two specific forms of allusion appear: wreaths of roses, and strings of beads divided into groups by marker beads. Both of these appear in paintings starting in the early 1500s (rose wreaths, for instance, in the "Feast of the Rose Garlands" by Albrecht Dürer in 1506). In the most general terms, there is a very long history of line-and-dot decorative patterns on all sorts of artifacts (pots, belts, architecture), which pretty much dates back to when humans started producing artifacts. It's always easy to generate provocative ideas about something having hidden significance, but you also have to consider in each case that there may be alternative explanations: and in order to test which is correct, you need to consider all the possible explanations and test them against whatever actual evidence you can turn up. Many theories have been generated based on the numbers of dots used on a particular artifact, but generally there is very little evidence that those who made the patterns consciously thought of the numbers as having particular significance. "As many dots as fit into the space and look nice" is likely to be the explanation in a good number of cases. With respect to swords specifically, Richard F. Burton's The Book of the Sword (1884) describes something he calls a "paternoster blade" (the link is to the article I wrote on the subject), and he hypothesizes that such blades were actually used in the counting of rosary prayers. The major drawback to this idea is that no competent sword wielder is going to make a habit of putting his fingers all over his blade. Fingerprints on a blade deposit water, salt, and acid on the blade, all of which promote rust and corrosion of the metal. Even the characters in sword-and-sorcery fantasy novels make a point of cleaning their swords frequently (however clueless they may be about history in other respects!). It would be reasonable, I think, to describe a sword as a "paternoster blade" if the term is used to indicate merely a series of dots or beadlike markings -- as, for instance, the word "paternoster" is used to describe a string of lakes or a type of elevator. But I don't think it's likely that such decoration was intended by the makers to have any actual connection to the rosary. Anyone interested in further discussions of rosaries and prayer beads is welcome to visit the Paternoster Row website and the Paternosters blog. In general I agree - one shouldn't look for patterns where they might not be. However, the patterns on these blades have crosses suspended from them in many cases - they're not simply patterns of lines and dots. The finger corrosion issue doesn't seem important to me. The sword in wear would need to be cleaned regularly - the hilt, exposed to the elements, would come into contact with the hand (especially when steadied by it) regularly, so there would be little incentive to avoid touching the blade. Scabbards can also trap moisture, spurring regular cleanings in any case. Beyond that, the pattern needn't be 'fingered' to still reflect the design of a paternoster. Crosses, prayers, saintly iconography etc. often figure on weapons, but we needn't assume the weapon itself was used in any devotional because of their presence. I doubt many soldiers prayed before their pavises with saints painted on them. I like this theory, but haven't we seen some German swords with this? I know our modern concept of "Germany" doesn't accurately reflect the kind of independent city states making up some/all of that area, but I'd be surprised to see such a Catholic symbol from what we think of as a more Protestant-leaning area. Of course, I could be way off-base. Perhaps there aren't many German examples of these or those examples come from non-Protestant "German" areas. Or maybe the Protestants maintained some connection to a rosary-like item. Just a lot of speculation on this interesting topic. I think my wording is unclear: what I'm driving at is that these all seem to be German, or the work of German smiths. So I'm asking: are there any that *aren't* German? Except that in the examples you've posted, the cross (when present) is not in the same "register" as the dots. There is a group of dots inside a linear "frame", and the cross is on the outside of the frame as a sort of finial to it. Supporting this idea is the fact that in a couple of the posted examples the "cross" isn't very cross-like and looks more like a fleur-de-lys or an asterisk. Also, in medieval art as I've seen it, the presence of a cross is *not* a Big Clue that something is supposed to represent a rosary. You have to remember that it is far more typical for paternosters/rosaries in this period to have NO cross at all, but instead to end in a tassel or sometimes a medallion of some sort. The idea that a rosary MUST have a cross is something that really only became dominant in the 19th century. 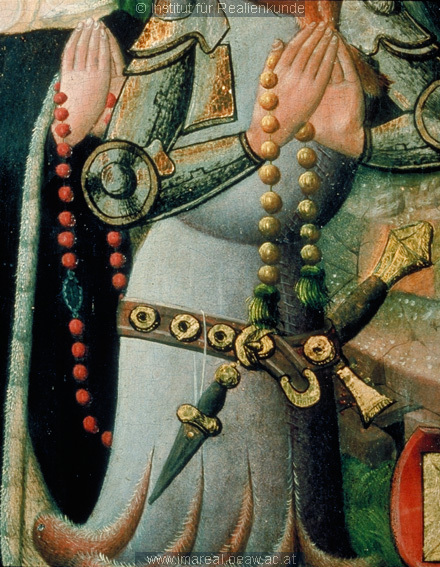 Instead, the Big Clue in medieval/renaissance art that something is supposed to represent a rosary is the arrangement of the dots into groups (usually but not always 10) with some sort of marker in between (such as a larger or differently-colored bead). I don't see that in any of the posted engravings. Thank you for your interest and contributions to the project. Pamela's observation is definitely one of those head slap moments. I actually did slap myself. While the bead motif at this point seems to match our ideas of what representing this on the swords would be like. It is, as pointed out, circumstantial evidence. The history of the use of prayer beads is very old but the rosary use and codification is right from the period, the 16th C, Pope Pius V to be exact. A turbulent time for society and the church. The instillation of this tradition by Pius V is said to have been based on long tradition of the use of prayer beads and the ideas of the 15 mysteries of the Rosary, which I believe where formalized at this time. Now this is in the context of the counter reformation, a great deal of religious violence, pressure from the Ottomans and the collation of Catholic states in the Holy League. A dynamic time to say the least. My suspicion is some of the early forms of this ornamentation may well be focused on particular producing regions or communities and, as they are so want to do, other producers pick it up as a sign of quality/meaning/selling point. Now to illustrate this with examples and research will take quite a bit of work and resolve Many of the examples maybe difficult to place in a particular setting for origin and as the tumultuous times of the day probably did a good job of stirring the examples around the European context. But at some point it had to have started and spread in use. By the time we get to the turn of the 17th C it may well have been a common motif that had lost some of its initial meaning. Glenn's point is very important to the understanding of this. 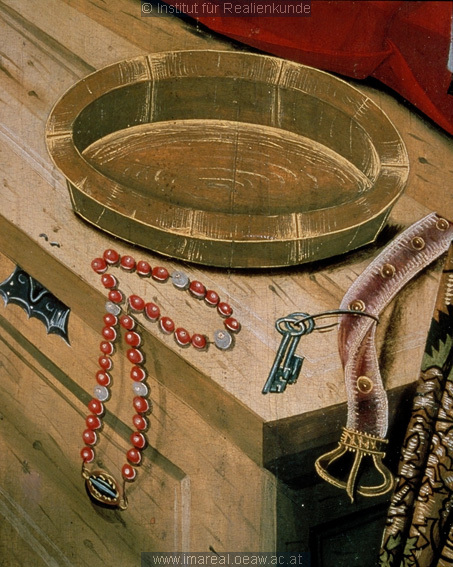 As others pointed out this does not seem to appear on blades until we get into the 16th C. The use of the paternoster beads and other traditions is definitely there prior to this and what we maybe seeing is this being represented and/or the iconography of this detail being recognized as the codification of the idea of the rosary is being formed. Thus it may well illustrate a part of its tradition. All very important and interesting aspects of the history of the period and swords in particular. Christian, i think you have identified a key area to finding more on the validity of how we are looking at this. The sword types that seem to have this style of ornamentation do often seem to be ones we identify with the areas around the Alps. It may well prove important that such production areas as Passau and Bresicia are important centers of production there. Other telling elements will be how often it is seen in blades that are attributed to such areas as Toledo and Solingen. While one can not deny that the maker with hammer, scribe and punch in hand would almost certainly find the line and dot a useful decorative technique for long thin objects. The form of distinct groups of dots and sections of line ending in a terminus that is distinctly cross shaped and all in a form that seems to mirror a symbol that many would be familiar with in that period, I think makes Pamela's observation very interesting. Well worth further research and discussion. It is one of those times when something right in front of you is seen in a completely different way when you change perspective. Thank you so much for your information and links regarding rosary and paternoster beads. I appreciate your input and research. I realize the danger of seeing patterns where there aren't any, which is why I am putting this idea out to the community. However, as Craig and Christian said, these markings consistently include a cross which indicates that they have a definite religious symbolism. I guess I am trying to discover what the connection between these lines and dots and the cross may be, especially since apparently it is a common marking. I look forward to any further insight into this question you may have. Thank you for the great information and critic. I do not think we are at a point to prove this is such a representation but rather the evidence so far seems to indicate it is worth researching further. While the presence of the cross is one of the elements that caught our modern eyes when the idea was first discussed it is not universal on these patterns as you point out. Some of the depictions could be representative of tassels in fact. I have seen some that are very tassel like representations. (now just have to track down an example). As you say it is a very fluid form for the use and design of these things in this period and with the religious strife of the period that we are seeing these appear it may well represent a statement by the maker as to their leanings. We are not trying to prove these are representations of codified Rosaries but rather that the motif being used would have been recognized in the period as having some religious connotation or significance. This can be shown to have occurred in other ways on blades from the dark ages on and would be well with in this tradition and the language used by the craft of blade making. This is a great point and one we are collecting evidence on. What are the patterns and numbers used? Do we see different sized beads illustrated? What forms of finial do we see being used? Does the line and dot pattern as depicted appear on other forms of weapons or armor? While the different sized beads are not represented in the examples we have, we do see the distinct groups of said beads in relatively uniform groups. Which, as you say, maybe just dots for dots sake or may be the delineation of the groups as one would with a larger bead. Medieval and renaissance decoration and embellishment is a rich subject, of which none of us are experts, so we are open to see what these disciplines can contribute to the understanding of this use of design. This is very true, any historian who is unable to see new evidence that may contradict their understanding of the past can be caught by their own assumptions. I have seen it happen many times and to challenge ones own interpretation over time sis often the difference between a great mind and one that just knows a lot. We would not consider publishing such an idea in a scholarly way with out a great deal more evidence and research. Our choice to gather others to help in a conversation about the idea is what we are doing here. This increases our ability to question our own ideas and the use the valuable suggestions and contributions of others who are interested in the idea as well. Your comments and information are greatly appreciated and I think very valuable in the discussion. By the way, the icon of a cross and an anchor is a very, very old religious emblem, perhaps among the first, going back to the catacombs in Rome c. 50 AD. There are graffiti in the Church of the Holy Sepulchar in Jerusalem from pilgrims c. 300 that show the same anchor/cross, perhaps in thnksgiving for a safe voyage. The iconism of Christ as the New Covenant "Ark" (Noah's, not the Ark of the Covenant), the concept of Christ as the Fisher of souls, and the Gospel accounts of Jesus on the Sea of Galilee all inform this motiff. Perhaps the same iconism also attached to blade designs and what I am going to suggest as an idea is pretty far fetched, but the outlining of the fuller on which the inscription appears, especially if it is a Christian motto or thought, may just be emblematic of the church. If you look at the blade point up, you get the suggestion of a church building/ark with a cross surmounting as on a steeple. 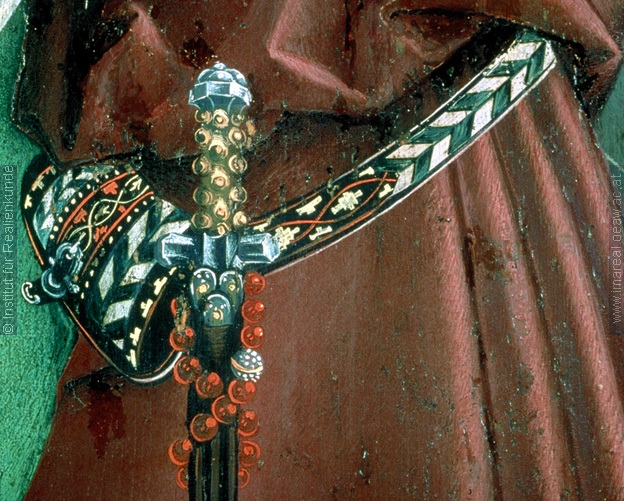 During this period, especially on Catholic blades (remember, this is Counter-Reformation and the 30 Years War/ War of Religion period) the idea of the Church being talismanic would have had very symbolic significance for as Christ protects and nurtures the Church, so the "church" on the blade would protect the bearer. All this is speculation but it is at least as plausible as Patricia's valuable thoughts. "Those who live by the sword...will usually die with a huge, unpaid credit card balance!" First, just to be clear: I'm not the poster of any of the images. That said, I'm not sure what you mean by register here. Looking at the image of the cup-hilt rapier in the first set of posts, the cross looks pendant to the arrangement of the 'string'. Your point is well taken regarding some of the terminations not looking like crosses. Again, the selection of images is not my own. I will have a gander at my catalogues at home soon though and see what I have there. I was aware that tassels could be present, but thank you for spelling this out clearly. My point was only that the presence of a cross (where present) meant we might want to consider the whole pattern, rather than putting it off to mere decorative lines and dots. Of course, they still might turn out to be just that. I'll keep this in mind as I look through some high resolution images. As Craig said (and I've "no dog in this race"), I'm sure there'd be lots more to do before anyone would publish. A question for you Chris, regarding crosses on rosaries/paternosters: are there any regional preferences for what is attached to them that can be delineated? How about if we confine ourselves to the 16th century? One other bit of food for thought for all concerned. It's quite possible that these patterns could have evolved; ie., have symbolized a paternoster in early specimens, but then evolved to simply be decorative. A good example of this may be seen in the 15th c. 'chaperone' style of hat; earlier, these were formed by rolling up a mantled hood, but later they were created with that shape pre-formed - a case of the original functionality having been lost, despite a (largely) consistent outward appearance. Posted: Tue 05 Apr, 2011 1:13 pm Post subject: other religious groups? of Germany remained strongly Catholic in the period of the reformation, but I'm not sure of that. German History buffs can fill in the blanks. Then I also realized that I was assuming that the Rosary was a Roman Catholic symbol, but that I really don't know much about the different splinter groups in what we broadly described as '' Protestants''. So my question is this, are there any ''protestant'' christian groups which continued to use the Rosary as the Roman Catholics did ? That said, I'm not sure what you mean by register here. Looking at the image of the cup-hilt rapier in the first set of posts, the cross looks pendant to the arrangement of the 'string'. I mean that the cross is not inside the frame, and therefore quite possibly not intended to be part of the same "meaning group" as the dots. People ask me this question a lot, and I have to say, in general, no, there doesn't seem to be much in the way of regional trends visible. In general, the non-bead parts of rosaries/paternosters seem to follow the same styles as whatever else was popular in the way of personal jewelry at the time. As far as I know, there are not many such trends that can be pinned down to a specific region: we think of medieval and Renaissance Europe as isolated and as having poor communications, but in fact, clearly there was a good deal of trade and ideas did spread widely, especially among the upper classes. So far, the only regional pattern I've been able to discover is a series of several dozen portraits of women painted in the Germanies in the early 16th century, who are carrying really large red coral rosaries. However I've also seen similar rosaries elsewhere and elsewhen, the most notable being an example from France in the 1620s, almost a hundred years after this style starts to appear. 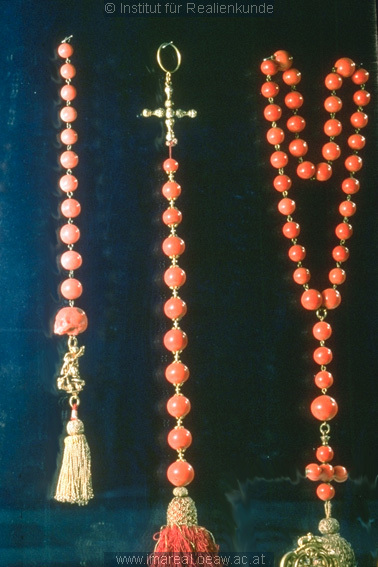 Large red coral beads were also fashionable in Italy, but they were generally strung differently. I should also point out that there are relatively few surviving rosaries from this era, and even fewer that we can be sure are in their original condition; many of them have clearly been repaired (not always correctly) or have later parts added. So our information has to come largely from contemporary documents (such as inventory records) and works of art, especially paintings. Generally the paintings are not detailed enough for us to see details of things like crosses and medals, so we don't have as much information as we'd like. If you click on this and enlarge it, you can see the cross 'hangs' off of the 'frame' which is actually the string of the paternoster, assuming that's what it is at all. Well, you're "singing my song" here: I've stressed much of the same in cautioning people about being too 'nationalistic' in their attempts to distinguish different swordsmanship traditions, such as "German" vs. "Italian". Great - that's all fascinating and useful information. Thank you! And this one is especially interesting because it involves a sword. If this was a common way to carry the "Betschnur" it would make sense if it migrated to the blade in stylized form. Anmerkungen: 123,3x98,4 ; Sonnenburg ; Katalog Gemäldesammlung, 1928, 24 , Paul Naredi-Rainer, Lukas Madersbacher, Kunst in Tirol, Innsbruck-Wien 2007, Bd. 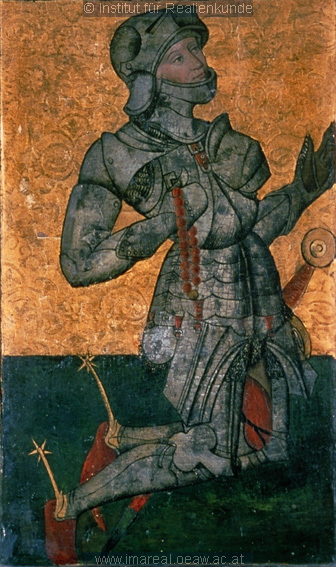 1, S. 519f. Sean, thank you! Those are terrific. I will be looking at them closely as I am sure they will yield some useful information.